Experienced VPN users are probably familiar with IronSocket’s predecessor, HideMyNet. The company, which is based in Hong Kong, decided to rebrand and reboot and is now conquering the market under a new name. With servers all across the world and improved performance, IronSocket is definitely one of the top 10 VPN providers around. Keep reading this objective IronSocket review to learn more about this company’s service and whether it can meet your needs. Save 40% on the annual plan. It’s worth it! To use the services of IronSocket you will, of course, need to sign up, which is a process that doesn’t waste too much of your time. The same goes for downloading and installing the client. IronSocket does not have a custom software client, so you will use the open source OpenVPN Connect client. After installing the client, you need to perform a few actions to connect to IronSocket’s VPN servers. Although you will have to install some files manually, this is an easy and straightforward process. Besides, IronSocket features comprehensive setup guides on their website that can be of great help to less experienced users. As for the speed and performance, IronSocket does very well in that department too, even with geographically distant servers. The service is fast and the connection is stable, even including upload, which is often a problematic issue. IronSocket offers terrific encryption. In addition, it offers shared IPs, which is great for privacy, and has servers all across the world. As for the P2P downloads, they are allowed on certain servers. Another great thing about IronSocket is that it’s not just for your PC or Mac. Thanks to the OpenVPN Connect client, you can use it on iOS (iPhone) and Android platforms as well, which is important in this day and age when people tend to do more and more work on their hand-held devices. Thanks to clear and detailed instructions, VPN can also be set up through L2TP and PPTP, DNS, HTTP Proxy and SOCKS5 on all platforms and it can be even used on Xbox360, Wii, Boxee, Apple TV and Roku. As their main features, IronSocket lists the possibility of unblocking websites with zero bandwidth restrictions, keeping your identity and data safe through encrypted channels and allowing you to surf anonymously on all your devices, no limits whatsoever. 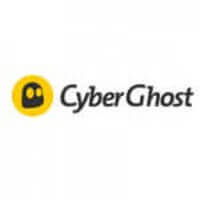 Like we already said in this IronSocket review, this VPN service provider offers all the encryption protocols that are considered the golden standard in the industry these days, which means PPTP, L2T/IPsec and, of course, OpenVPN. In addition, customers have access to HTTP, SOCKS5, and DNS Proxy. This is definitely not something we get to see often with VPN service providers. DNS Proxy is a particularly interesting feature since it is offered for free and you usually have to subscribe and pay specifically for this service. 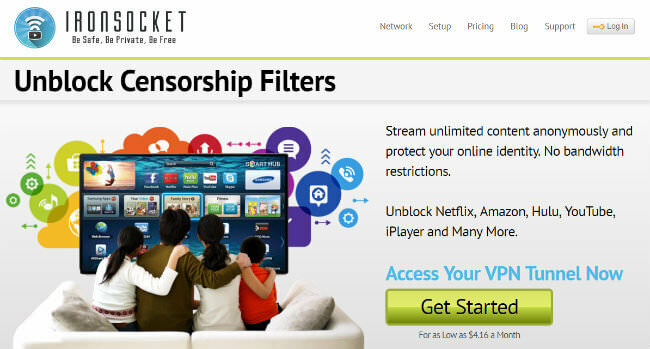 It allows you to access content from services that are not available in your country (Netflix, Hulu, Pandora, etc.). As for the servers, IronSocket is definitely not the provider with the best coverage in the world. They are present in 40 countries and have some 50+ servers. P2P is available, but only in certain locations, i.e. on certain servers, such as Thailand, Saudi Arabia, Romania, Brazil, Ukraine, Russia, and Poland. This provider does not offer custom software, which basically means setup and configuration are somewhat trickier than with other providers. However, they do offer extensive and helpful tutorials and their customer support is available 24/7 for any kind of assistance. Unfortunately, there is no live chat, but the support ticket system seems efficient and quick enough. IronSocket offers a 7-day money back guarantee in case you are not happy with the service and want your money back. IronSocket is based in Hong Kong, which notoriously has some of the most lenient Internet laws around. For some reason, the service decided to keep a lot of user data, mostly through cookies. It stores your IP address, as well as the log time and date and total bytes per session, although it does purge this information every 72 hours. This may not be the best privacy around when it comes to VPNs, but it’s still good to know that IronSocket is incredibly transparent about user logs. Keep in mind that you can always pay using Bitcoins and even gift certificates from Kmart, Walmart, and Starbucks, which guarantees complete anonymity and protection of your personal data. The FAQ section offers detailed and clear answers to pretty much every question you might have, but if you still have some doubts or are experiencing difficulties, you can make use of the terrific support feature, which is very clearly marked on the page and includes several detailed set-up guides, support tickets for subscribers and, of course, an e-mail form for direct contact. You will note that there is no live chat option for support, which is a deal-breaker for many potential users. Still, it needs to be said that the support ticket system is really excellent and, on most days, has short response times. We talked to the customer support staff while doing research for our IronSocket review and only have words of praise for the efficient and helpful support team. 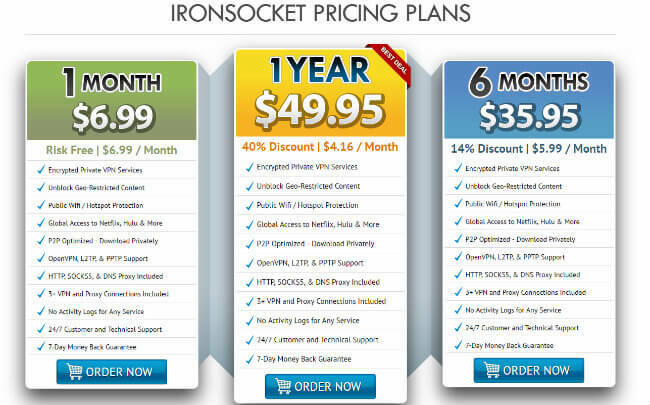 The cheapest package, which starts at $6.99 per month, covers all the features offered by IronSocket. So, if you only need this service for one month, you can pay less than $7 for the full package of services. The best value package comes with a one-year subscription at $49.95 and the six-month subscription is $35.95. IronSocket does not offer a free trial but if you are not happy with the service, there’s a 7-day money back guarantee. As we wrap up this IronSocket review, here’s a quick overview of the features that wowed us and the aspects of the service that could use some improvement. Keeping records of IPs and logs. Our ratings are the result of an objective and independent evaluation of IronSocket, generating the final rating that reflects the overall quality of the company. Ratings may change as the service changes. IronSocket user rating based on 7 user reviews. I signed up for IronSocket because I wanted to be able to watch my favorite shows while I’m abroad. I spend four months per year abroad and this makes me feel like I’m back home at least a bit. I feel like for this kind of money I should be getting better of everything – better encryption, better speed and better customer service. I mean, it’s not bad, it’s pretty decent, but it should be cheaper. Last night I contacted customer support because my VPN stopped working for some weird reason. I have no idea how, but they fixed it for me. We found 2 verified IronSocket discounts for April, 2019. Sign up and we’ll let you know about future IronSocket promo codes. Discover the full range of possibilities IronSocket offers and become an advanced user in no time with our beginner-friendly IronSocket guides. Whether you are interested in secure torrenting, unblocking Netflix, setting up IronSocket on all your devices or you simply want to learn more about IronSocket, you can find verified information and clear instructions in our IronSocket guides below. 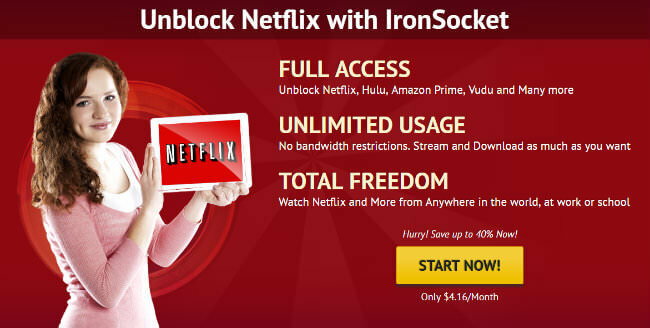 Does IronSocket Work With Netflix? - informing you whether IronSocket has managed to resolve the issues it has been experiencing and provide its users around the world with easy access to Netflix.